Sometimes you need to make a big brew for you and all your friends. One of our single-origin roasters, Harry, told us what to do to make coffee for the whole roastery floor. You’ll need a gram scale for this! Step 1: Grind 60 grams of coffee a bit coarser than normal for Chemex. Step 2: Prepare 900 grams of hot water at 204 degrees Fahrenheit. Step 3: Pour 100 grams of water over the coffee grounds and let them bloom for about 30 seconds. Step 4: Pour the water over the coffee in stages. First, pour 200 more grams of water, let it drop, then pour another 200g. Pause, then pour 150 grams. Let that settle and pour in the remaining 150 grams of water. Step 5: Divvy it up and pass it out! The whole brewing process should take 6-7 minutes. 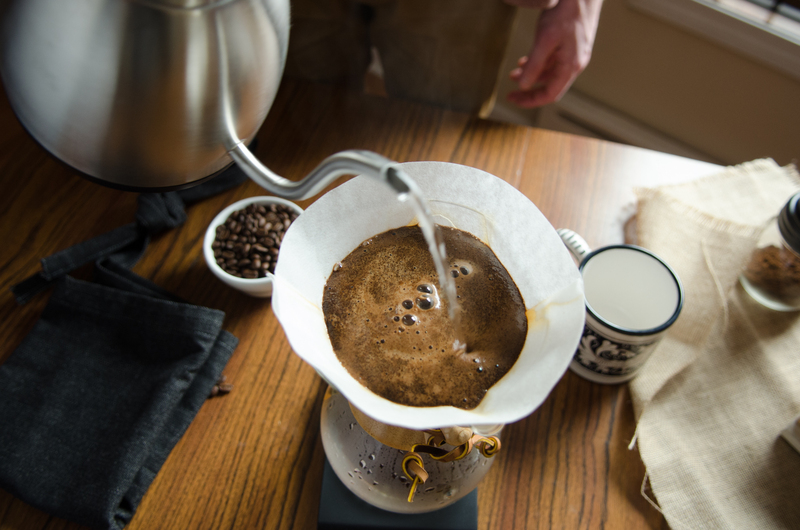 If it’s going noticeably slow, feel free to lift the filter out of the Chemex to increase airflow at the end. Pro-tip: Don’t forget cups! Our roaster Anthony always comes over with a big, fresh Chemex…and nothing else to drink it out of. Check back daily for more coffee talk! Have questions about brewing or beans? Shoot an email to social@lacolombe.net.